Should you fall into a large sum of money, you might enhance your gothic library by collecting high quality leather bound horror books by Easton Press. Naturally, Easton Press chose the death's head moth motif for the cover of their "Silence of the Lambs" edition. 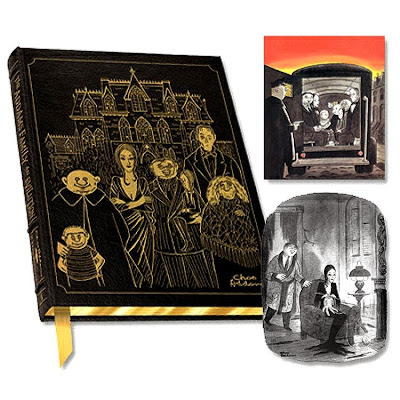 Easton Press also did an edition called The Addams Family: An Evilution." The author is H. Kevin Miserocchi. I feel like Easton Press really skimped on these boring covers for the five-volume Anne Rice's Vampire Chronicles. At least this particular set is autographed by the author. I'm delighted with the cover art they chose for their edition of Ira Levin's "Rosemary's Baby." They chose a red leather cover for H.P. Lovecraft's "At the Mountains of Madness." Here's a gorgeous edition of Bram Stoker's "Lair of the White Worm." Click on the listing to get a peek at some of the color illustrations from the inside of the book. I love the spiderweb on the cover of "Ghost Stories of an Antiquary" by M.R. James. No gothic library would be complete without "The Strange Case of Dr. Jekyll and Mr. Hyde." And of course, you'd need a copy of Mary Shelley's "Frankenstein" on hand. (Check out the cover art featuring hands). It's also available on Amazon. Might you want to page through "The Birds and Other Stories" by Daphne du Maurier? Of course their edition of "Dracula" has bats embossed all over the front cover. And their edition of Edgar Allan Poe's poems has ravens on the front cover. (It's also available on Amazon).